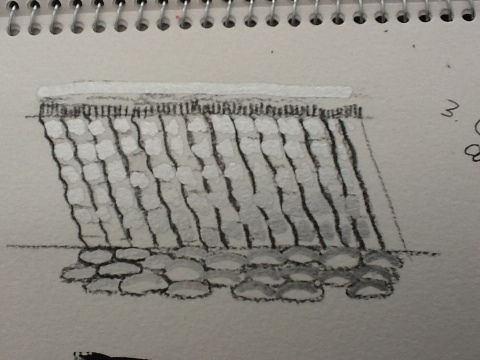 I started off my making some observational notes on the image: The steps have areas of dark/light. The colours include shades of grey, cream, black, brown and blue. Then there is a tiled piece of ground which consists of an even pattern of lines, criss-crossing. Shadows of the trees form silhouettes on the tiles. There is another section of rocks which form a mosaic of white, grey and blue. 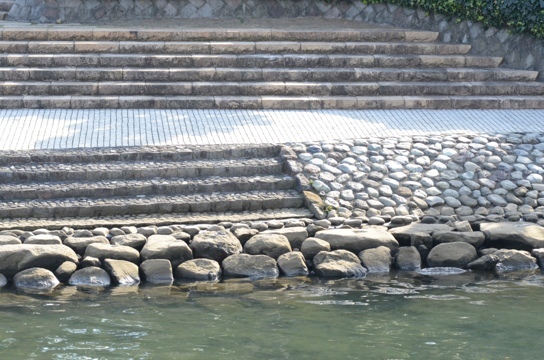 There is another section of steps but these are made up of small round pebbles, forming an orderly pattern of grey, blue, white and black. Leading down to the water, there are huge rock boulders, which in contrast to the smaller more even rocks and pebbles are uneven, with bumpy surfaces and sharp edges. The water is a great contrast to the rocks, with the reflections of the rocks softening the textures and the light catching the water in swirly patterns of green, blue and white. 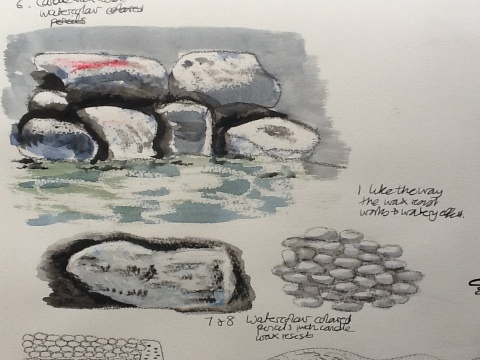 i) Starting off using a charcoal pencil, I chose a small section of the steps, boulders and water. I tried to draw simple lines to catch the feel of the different textures. I started imagining how this would translate to a fabric collage with swirly stitching representing the reflections in the water. 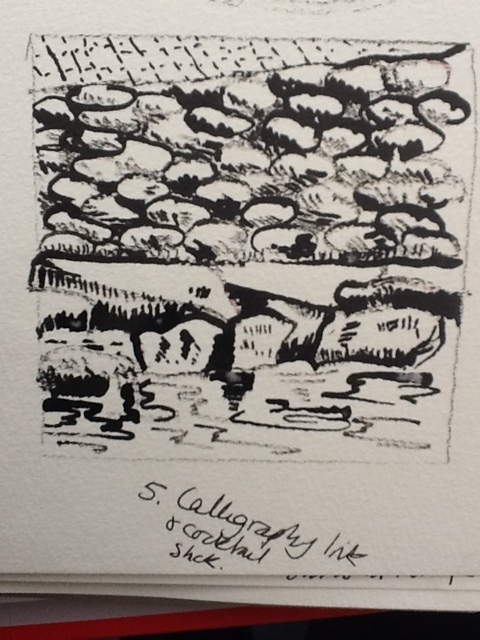 ii) I then did another charcoal study of a close-u f several boulders and the water. 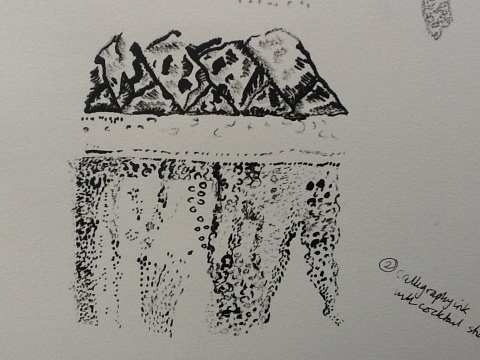 I was able to use a variety of lines to represent the texture of the boulders and their uneven surface. iii) Next I looked closer at the section where the stone steps meet the tiled area. 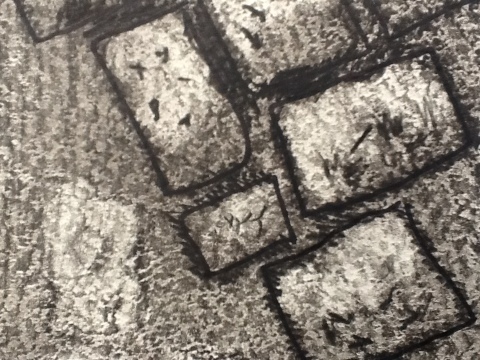 I used charcoal pencil again to draw the shapes but this time added silver pen to portray the light catching the stone. 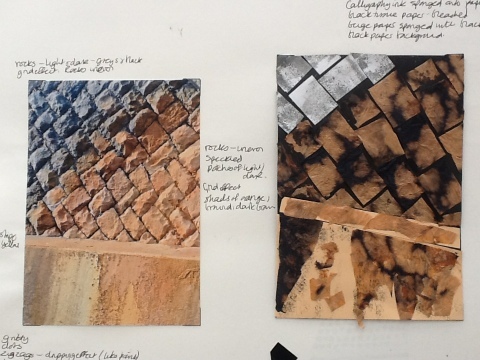 iv) I then continued using calligraphy ink and cocktail stick – materials which I greatly enjoyed using int he previous mark-making exercises. I found it easy to use the cocktail stick with differing amounts of ink to show the texture. By letting the ink run out, I was able to vary the thickness and strength of the lines. This worked particularly well when studying the reflections. v) I then worked on a small study to try to capture the contrast between four different layers of the photo., using the techniques above. 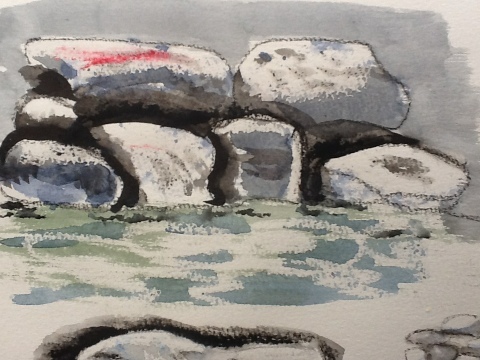 vi) Lastly, I decided to add some colour and carried out a study of the boulders and water, using watercolour pencils and candle-wax resist to capture the reflections in the water. I was very pleased with the way this worked out and feel the wax-resist was a useful technique to create the watery effect. The next image selected is a photo of a wall. The top section of the wall is made up of huge rock boulders, tessellating but uneven. 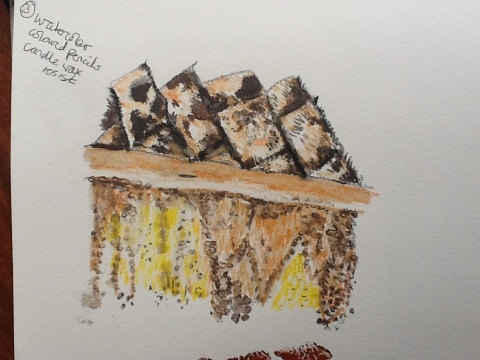 The rocks change from grey/black to orange, brown, with speckled patches of light/dark. Then there is a step of painted concrete. The vertical drop of the step had flaking paint forming an interesting texture and a variety of colours. Some areas are smooth, others gritty, or sand-like. 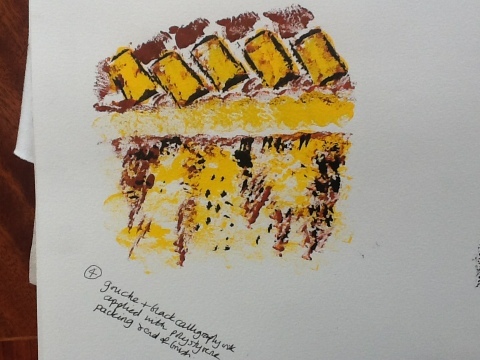 The paint forms a dripping effect with various shades of brown, yellow and orange. I started off using graphite pencil. I chose a small area of the photo and worked hard to show the different textures. 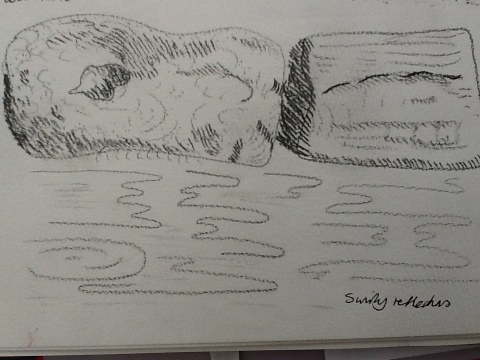 I was able to show the contrast between the heavy boulders and lighter texture of the concrete area by using heavy/light strokes of the pencil. Next I made a study of the same area using my favourite materials – Black calligraphy ink applied using a cocktail stick. The cocktail stick worked well as I was able to portray the feel of the grittiness by making small dots and circles. I then started to think about colour. Continuing with a technique tried with the last image, I used candle wax resist to show the areas of light/dark. I then added watercolour pencil to show the areas of changing colour and then applied water on a small brush over some of the areas. this worked quite well but I felt I had not shown the contrast between the two main textures very well. Next, I tried acrylic gouache to make a bolder drawing. I applied the paint with polystyrene packing pieces for the boulders and the end of a brush for the flaking paint. 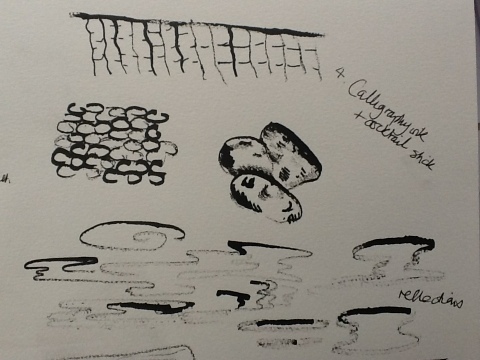 I then highlighted areas with calligraphy ink using the same printing implements. I was pleased with the way this study worked out and wanted to see how it would translate into a collage. Using pieces of black tissue, previously bleached, white paper sponged with heavily diluted ink and beige paper sponged with ink, I made a collage on a background of black paper. I was really pleased with the way this worked out. I enjoyed working on this image and can think of some ways I can further develop my design ideas. 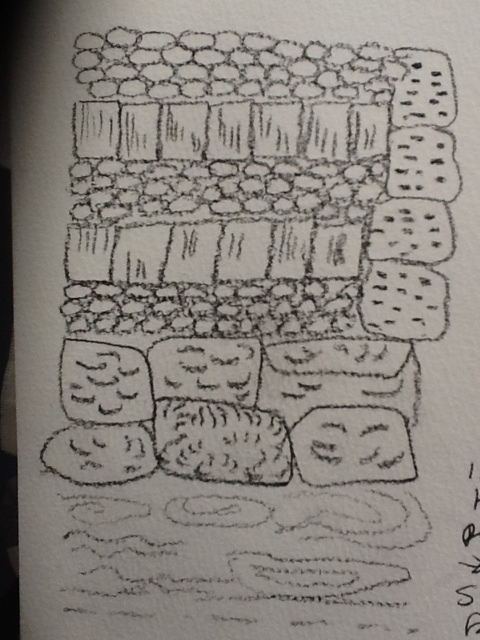 I pulled out an earlier exercise I did of graphite pencil shaded over rough textured watercolour pencil and rectangles of graphite rubbed out in places – and thought this would be a great way to represent rocks. The last image I worked on was of the rusty boat. This was my favourite and I kept wanting to try new ideas. I really had to reign myself in as I could spend weeks on developing ideas from this image! The photograph was taken by me of a rusty boat in a boatyard in Ito, Japan at New Year. 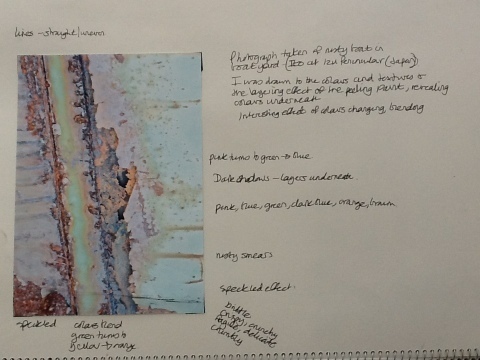 I was drawn to the colours and texture of the layering effect of the peeling paint which revealed the layers underneath. The blending colours created an interesting effect and I was immediately inspired, thinking of different ways in which the image could be developed into collage, printed fabric and stitch. I first of all, I made some written observations of the effects in the image. Pink turning to blue, dark shadows revealing the layers beneath. 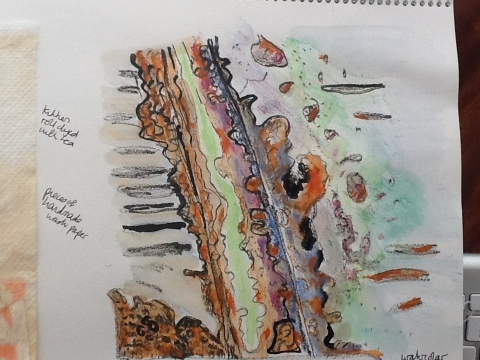 Pink, blue, green, dark blue and brown rusty smears.Speckled colours blending to green, green turning to yellow and to orange. Brittle, crispy, crunchy, fragile, delicate and crumbly. 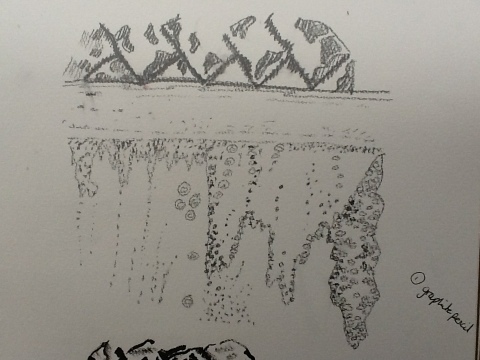 I started by drawing a sketch of a section of the image, using ink and cocktail stick. I then applied watercolour pencil, adding water by brush to blend some areas. I did not look too closely at the photo as I did not want to be tempted into attempting a close observation drawing. Rather , I wanted to create the ‘feel’ of the image as instructed in the manual and I think I achieved my aim! The colours I used were inspired by the photo but not ‘true’ to the photo. 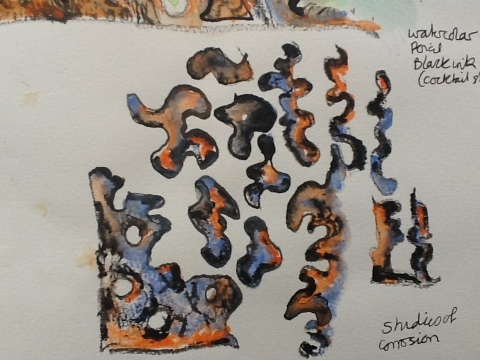 ii) I then took very small sections of the drawing and did some ‘studies of corrosion’ in ink and water-colour. These did not relate directly to the original image but from my drawing. iii) I then attempted collage inspired by the image. I layered tissue paper, rough silk tops, and bleached paper napkins onto kitchen roll. I added some tea-stained tissue, some twine and then added highlights in black pen. I was attempting to portray the fragile layers of the flaking paint and was pleased with the result. Until now, all the exercises have involved materials, media and techniques already familiar to me and I am ready to come out of my ‘comfort zone’ and try some new techniques and materials. 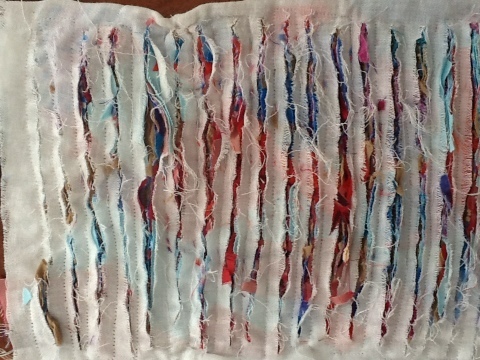 I have been browsing through a lot of blogs, books and watching several podcasts on various textile techniques and was inspired to have a go at ‘slashing’ to create the layered effect with fabric. 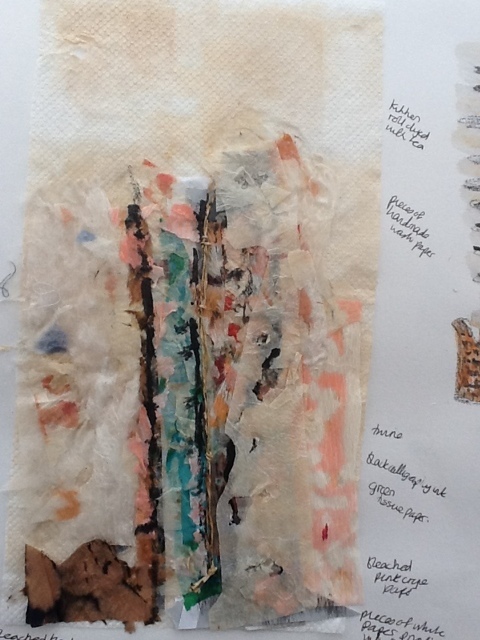 I layered pieces of fabrics, paper, old cut-up tights and bits of thread inside a folded piece of white calico and machine-stitched all around the edge and then up and down all the way across the fabric. I then cut through all the layers (being careful not to cut through the bottom layer of calico to achieve the slashed effect. This was great fun and though I am in danger of veering off-course, I am so pleased that I feel inspired enough to try these techniques after many years of suppressing my creative tendencies!